Anyway, this was back in Bangor when I felt like dressing up a bit, only for my lecture to be cancelled, and then I had Belly Dancing in the evening! Oh well, these things happen I suppose! I ended up not getting changed for dance – couldn’t be bothered :p Wasn’t the most suitable Belly Dance outfit but I did discover it made chest isolations easier! Haha. 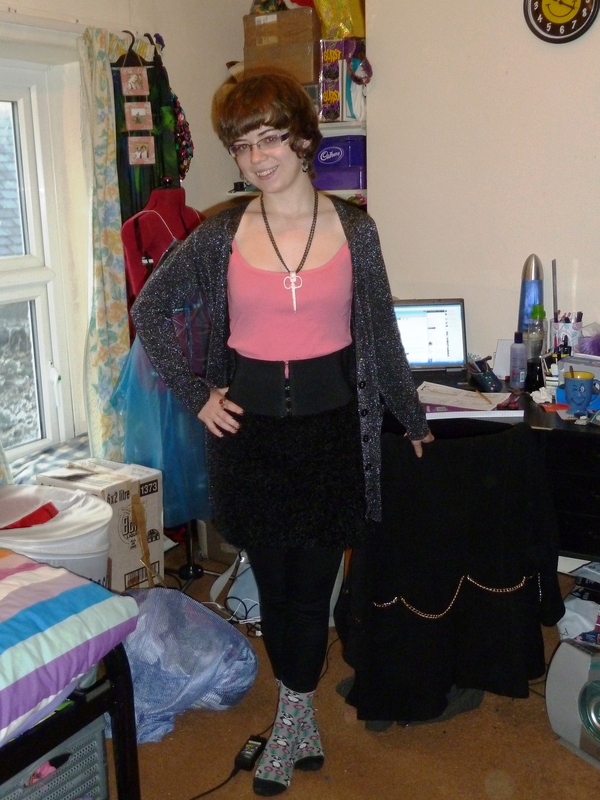 The outfit itself consists of a fluffy scarf worn as a skirt, pink T-shirt from Mum, black cardi I wear way too much, black tights, novelty socks (I believe they were a birthday present in first year! ), plus my ‘Mummy’s Scissors’ necklace and a wide black elastic belt. Another Christmas Meal! This time with my Grandparents and Parents at the Bradford Arms Hotel, Llanymynech 🙂 The food was really nice – I had garlic mushroom with cheese and bacon to start, then sea bass with spinach, tomatoes and veg for main, and lastly chocolate brownie with cherry compote for pudding! I couldn’t finish my pudding even though it was amazing….just too full!! Outfit – dress from Mum, shorts (not really seen) charity shopped, black tights, lime t-bars recently purchased from a charity shop 🙂 Best £3.50 for a while 😛 Handbag is a vintage one from Grandma’s collection 😛 It is beautiful…soft beige base, covered in tiny wire coils and bright beads. Some are missing or loose, but it still looks amazing! This entry was posted in Outfit posts. Bookmark the permalink. Audrey Hepburn!!!! She’s just such a classic style icon! Love the whole green outfit in the end =D That turquoise (? — I’m not very good at discerning colours) is amazing! 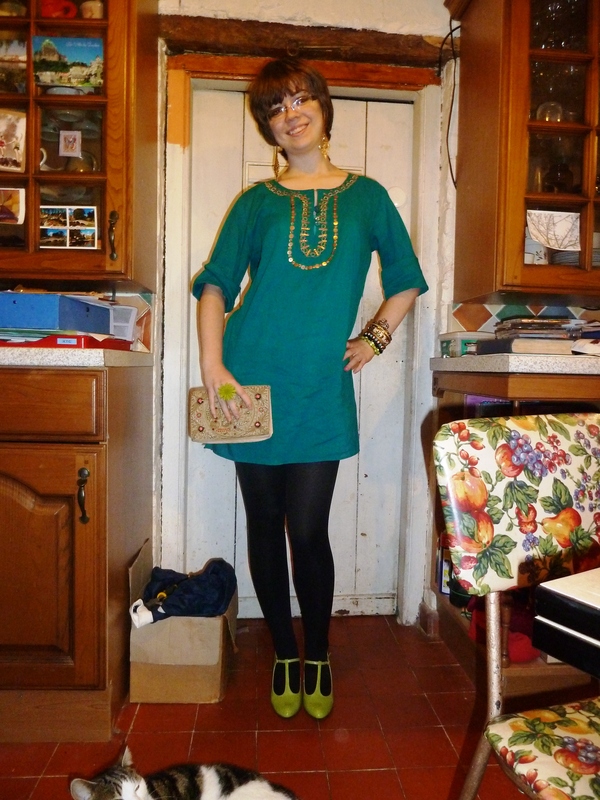 I love the outfit for the meal in Llanymynech 😀 The green shoes look brilliant…and just the whole outfit! Also, wool + cardigan + warmth = KATE LOVE!